Good question. I’m always reluctant to buy a new Garmin; it seems that whenever I do they release an updated model a few weeks later, and the one I’ve just bought never gets the new features, even if it has the apparently requisite hardware. Either that or they go all-out on a new design and you’re left with the teething troubles. But I digress. My Forerunner 920XT has been serving me well, though I really wanted optical heart rate monitoring so I can use it ad-hoc on hikes and longer walks without having to bring the chest strap. The built-in, routable European map would be a huge bonus as I’m often running in new locations and lifting your wrist is so much easier than most other forms of navigation. The ability to play music straight from the device means I can leave the iPhone back at base, even if I have to get yet another set of headphones. The Fēnix 5 Plus ticked all these boxes while allowing me to stay in the Garmin ecosystem, which is a consideration when you’ve already got a number of other devices for hiking, cycling, automotive, etc. And it’s new, and it’s shiny. Not that this ever matters, right? Once I’d talked myself away from the much discussed downsides (poor battery life, inaccurate sleep detection, poorly supported Garmin Pay – more on those later) the only question that remained was which one to choose. I knew that the Fēnix 5S Plus would be too small and the Fēnix 5X Plus too large, which left the regular Fēnix 5 Plus, in a range of finishes and bands. In my heart I lusted after the top-end titanium version with the metal band, but the inclusion of a free silicone strap made me question whether a) the titanium band was suitable for workouts and b) whether I really wanted to keep swapping bands all the time. I already knew that despite their comfort and jewellery value, metal bands annoy the crap out of me as they slowly wear away my MacBook’s palm rest, leave marks on a partner’s fitness watch if you’re both tracking sleep, and show up every single scratch in the process. Some might say that all this adds to “patina” but no, I’m not spending upwards of £1k for an instant antique. What I didn’t know back then was that the metal strap would have probably been useless for optical HRM, more on that later. In the end I went for the one with the orange strap, or “Solar Flare” if you will. A crystal sapphire screen seemed to make sense on a 24/7 watch, and the 10g titanium saving over the regular model might make the optical HRM more efficient as there’s less bounce when running. Light scratches should show up less on a bright bezel than a dark one, and I just like the 3 colour look better than all black, not sure why. John Lewis had one in stock and give 2 years guarantee by default, so in a moment of fitness-inspired madness I took the plunge. Wow, it’s gorgeous! The first thing that hit me was the quality of the band; very pliable with just the right amount of elasticity yet it doesn’t feel cheap and doesn’t snag on the inside of your sleeve like most other manufacturers’ silicone bands. Both parts are quickly removed from the watch itself via a simple yet effective lock mechanism which smacks of Apple quality, and at £45 for a replacement it had better be. Let’s hope that lovely orange keeps its shade – silicone has a habit of discolouring if you’re not careful. The watch itself feels great too; just the right amount of weight thanks to a fibre reinforced polymer body and titanium back and bezel, good tactile feedback from the buttons, and a reasonably intuitive system of menus. I’ll admit to being massively disappointed with the brightness of the screen at first, having charged the device fully and switched it on indoors. The display was nothing like the pictures you see online, and my Forerunner 920XT was much brighter, with and without the backlight. After some digging in the menus I found a setting for backlight brightness and was relieved to see the default is just 20%, with 100% being much better. Satisfied with that discovery I turned it back to 20% – go figure. Having used the watch in daylight I’m happy with the screen, it really works best in bright sunlight and if that’s at the expense of some colour definition under artificial light then that’s fine with me – it’s an outdoor watch after all. What I wasn’t overly impressed with out-of-the box was the optical HRM, my first experience with this kind of technology in a fitness application. Most of my other watches have the aforementioned metal bands, and I like to wear them loose enough so that they sit on the wrist bone when I drop my arms but not loose enough to spin on the wrist. When I wear the Fenix 5 Plus like this, it only gives a semi-sensible HR reading when it has good contact with the skin, i.e. when my arms are by my side and it’s slid all the way down, or when I’m sitting at my desk. Even then it’s easily disturbed by sleeves or movement, with the result being some unexpected variance in readings or an unrealistically low heart rate. I’m no elephant, but 30 bpm? Perhaps not. Cranking the band up one notch improves things, but while not being tight it’s a little more snug than I’m used to, and I’ve found myself backing it off again when I go to bed if I’m not to wake up with markings all around y wrist. Since I still have the Forerunner 920XT and its premium chest strap HRM I’ve done a series of comparisons between that and my new Fēnix 5 Plus. These were carried out on my regular go-to circuits which I run / cycle several times a week, so I know what to expect, and proved quite surprising. One of the downsides (upsides?) of living on the Isle of Man is that there’s not a lot of flat land, which means you’re either coasting or working hard, and my usual 5k loop is no exception. It starts with a gentle downhill section of about 750m, followed by a gentle climb, then a few level km around a lake. Coming home is the reverse, ending with that lovely climb which normally has me moving from a low Z3 to a mid Z5. Here’s how the whole things looks on both devices; the Fēnix 5 Plus with its optical HRM and GPS + GALILEO, and the Forerunner 920XT with chest strap and just GPS. This is a downhill slope which starts moderately and then flattens out. Both the Forerunner 920XT and the Fēnix 5 Plus build HR gradually as I warm up and start getting into the swing of things, picking up a small dip in pace as I check both devices towards the end of the this section. Section B starts with a symmetrical dip in the road, where I coast down one side and puff up the other. Both devices reflect this in their readings, but the Fēnix 5 Plus lags maybe 5 bpm behind the Forerunner 920XT, taking a couple of minutes to catch up. The section ends with a gentle downhill slope to the lake. The only real flat part of the circuit, section C, is a circular loop around a lake, which I take at a constant pace. The readings from both devices are closely aligned here, no more than one or two bpm apart. As the section ends, there’s the matter of the short uphill slope back to the road, and although the Fēnix 5 Plus mimics the Forerunner 920XT’s profile as my HR increases it’s a good 10 points behind. Section E, which starts with a sprint up the dip in the road and then levels out. The Forerunner 920XT picks up the change in HR straight away, climbing to 170 bpm / Z5 as I puff and pant my way up the short hill, but when I get to the top I notice the Fēnix 5 Plus is barely pushing the sort of HR that I had while jogging around the lake. As I carry on and relax a little on the flat section before the final push, the Forerunner 920XT shows me beginning to recover, while the Fēnix 5 Plus finally realises I’m working out and increases its reading. By the time I start the final climb, the downward trend of the Forerunner 920XT ends and it starts to rise again, meeting the Fēnix 5 Plus which hadn’t even noticed the reduction in load. Now both devices show a climbing HR, but they’re not even in the same ballpark until the end of the climb, when I’m well and truly in Z5. This is actually another regular running loop which lends itself well to a cycling test thanks to two short but arduous hills, both of which I sprint and measure as splits whenever I run or cycle this route. For this comparison I’m using a Garmin Edge Touring Plus paired with the same premium chest strap that I use for running, and of course the Fēnix 5 Plus on my left wrist. Starting with the gentle downhill again, I’m straight into the upper gears in order to warm up. Both devices start to register the change in HR, but the Fēnix 5 Plus lags a little behind. I’m now just over 150 bpm as I crest the hill and begin to relax, but the Fēnix 5 Plus still shows me in the anaerobic Z4 whereas in reality I’m quite well rested by the end of stage C and preparing for my first hill. This section is a gentle climb of maybe 40 meters elevation over 300 meters distance and makes for a good benchmark, which is why I always time it as a lap. The Forerunner 920XT shows my HR broadly as I experience it, climbing steadily and then flattening out near the top. The Fēnix 5 Plus bounces up and down a bit as it always does, then figures out what’s going on and catches up once I’m near the top and it’s all over. Section E is a steep downhill, no pedalling and hard on both brakes. This is typically where I take a breather in anticipation of the second timed hill. Both devices show the decrease in HR, but where the Forerunner 920XT has me almost back down to warm-up rpm the Fēnix 5 Plus is a good 15 clicks higher by the time I hit the last hill. Another timed section, and I’m usually fully revered from the last one and back at rest by the time I start this. The Forerunner 920XT agrees, the Fēnix 5 Plus hasn’t quite caught up yet. It’s a steep hill and I’m out of the saddle (always looks good on a touring bike with front & rear racks!) with my HR climbing sharply through the zones. I always hit Z5 halfway up this hill whether I’m running or cycling, and the Forerunner 920XT shows this consistently. The Fēnix 5 Plus not so much – it’s still reporting less bpm than it was (erroneously) showing when I was gently coming downhill in section C, but at least it’s climbing. The reading on the Fēnix 5 Plus continues to climb as the gradient decreases, but its jitteriness makes it difficult to say whether the numbers are in line with the subtle changes in elevation or whether it’s just noise. The Forerunner 920XT meanwhile gives stable, useable data. On to the final climb now, and both devices show a gradual increase in load, finishing firmly in Z5. If you compare the Fēnix 5 Plus optical HR sensor’s data to that gained with a chest strap you’ll get broadly similar results, provided you only care about maximum / minimum / average HR. Where the optical sensor begins to lag behind is in its ability to detect changes in pace, and here it’s so bad that I’d call it unfit for purpose. This effectively means you can’t use the Fēnix 5 Plus alone if you plan to track HIIT workouts or improve your anaerobic fitness, something Garmin obviously knows about because they won’t let you start the built-in lactate threshold test until you pair an external HR sensor. It’s probably a limitation with the technology rather than the way it’s been implemented, and I’d cut Garmin some slack if they were a little more upfront about this or if the device were cheaper, but £749 is a lot of anyone’s dough for a HRM that doesn’t meet expectations at that level. I wanted to split my feedback on the Fēnix 5 Plus optical HRM sensor into two distinct activity types; those that do raise the average heart rate significantly and those that don’t. In other words, sports / fitness use versus everyday activities like walking and hiking, because I’ve had some very different experiences here. My expectation was that while not as accurate as a chest strap, the optical heart rate sensor would be able to give me some anecdotal insight into how hard my body is working when I happen to think ‘Wow, these stairs go on for ever’ or similar. I could look at the watch, gain some small satisfaction from the knowledge that I’m in zone 3, and maintain the pace for a while longer instead of slowing down, since it’s improving my aerobic capacity. But it was not to be. Quite simply, the Fēnix 5 Plus optical HRM has so far proven to be beyond useless when it comes to walking or hiking, on the basis that wildly inaccurate data is worse than no data at all. I can be speed-walking at 5 mph and apparently I’m in zone 0.1, which isn’t even warm-up. Or I can get up from a 30 minute lunch rest, restart the activity while standing still, and immediately be in zone 1.7. The actual bpm isn’t even relevant here, what’s relevant is that the numbers being reported bear no semblance to what I think my body’s doing. To test the optical HRM on a hike, I strapped my trusty Forerunner 920XT to the right wrist and paired it with the chest band. The Fēnix 5 Plus was fastened snugly to my left wrist, a loose base-layer, mid, and shell jacket over the top. (In fact I experimented with a number of clothing configurations since this initial arrangement made it cumbersome to check the device while walking, but nothing made any tangible difference during the hike). For a good measure I also clipped my Garmin GPSMap 64S to my backpack as I’m planning to use this exercise as a GPS comparison also, and the 64S is my gold standard for accuracy in that department. 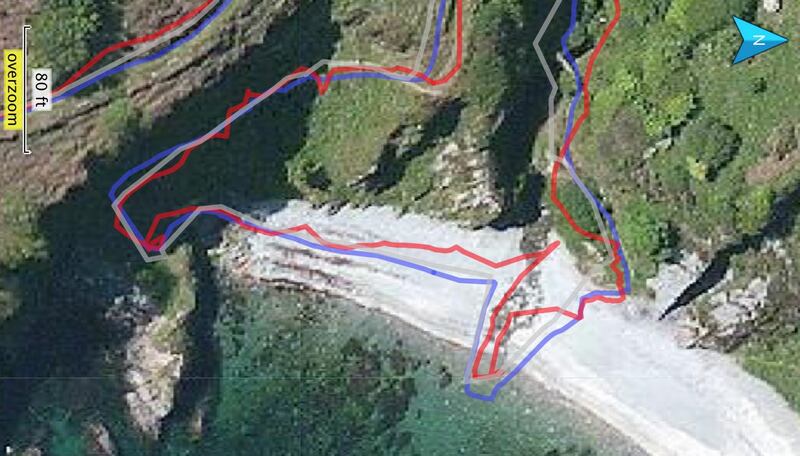 I chose a hike to Dhoon Bay via the Glen as the selection of gradients would give me a good chance to test the various HRM devices, and because a variety of terrain should give the GPS a decent workout too. More on that later. The route starts by crossing the road from the car park and then forking right to follow a steady downward path which snakes back on itself a couple of times before dropping to the beach. There’s no tree cover for most of the way and the going is good. The path back from the beach meanders through the middle of the glen, and the limited sky due to the ravine is obscured by trees. It’s quite steep in places, and a series of 190 wooden steps take you back up to the road. A good workout then. First up it’s the Forerunner 920XT, and I’m including elevation and pace this time because they have a direct bearing on the heart rate (and because I’m getting lazy – this data’s straight from Garmin Connect). The graphs are as you might expect; low HR on the descent to the beach, raising on the return climbs with one marked bump where I kept the pace up despite a very steep section. The HR drops as I rest for a couple of minutes before carrying on. The Fēnix 5 Plus captures broadly the same changes in elevation and pace, but its impression of what my ticker was up to is a little more “out there”. We see several spikes above 100bpm for no reason during the descent, which is odd because it had such difficulty detecting actual sudden increases in HR during my running and cycling experiments. Once I’m making my way back from the beach the Fēnix 5 Plus really gets into its stride, climbing sharply to around 150bpm while the Forerunner 920XT has me just beginning to warm up at this point. Yet the Fēnix 5 Plus completely missed my charge up the steep section and subsequent rest, instead showing the same kind of HR as it did on my way downhill at the start of the hike, minus the random spikes, before dropping inexplicably to resting levels at around 42 minutes in. The Forerunner 920XT was showing 130bpm at this point. When it comes to hiking, you may as well switch off the optical HRM and save on battery, because the thing is worse than useless. I tried so hard to cut it some slack (justify the money spent?) by post-rationalising over the results. Was my circulation at the skin’s surface reduced due to the cold temperature? I tried with the device exposed to the elements and also with it under 3 layers of clothing. The average temperature recorded was 20℃ and the minimum 17℃. Was the strap incorrectly adjusted? I tried 3 settings ranging from loose as a bangle to tourniquet. Same same. Tried shaving your wrist? Go on then, in the name of science, but still no cigar. Since the hike I also recorded several daily walks that might be of relevance, and although I wasn’t wearing another HRM to compare against I’ve yet to see a reading on the Fēnix 5 Plus which matches my heart rate as I’ve come to understand it over the years. At a base level I’d be happy if I could just make it perk up from < 100bpm by running up some stairs, but here again it just won’t play. When I read that the Fēnix 5 Plus would be getting support for GALILEO as well as GLONASS I was mightily impressed. My 64S supports GLONASS and performs remarkably well in challenging terrain such as forests or in cities with tall buildings, though to be fair that device also has a prominent quad-helix antenna and isn’t strapped to my wrist under a jacket. 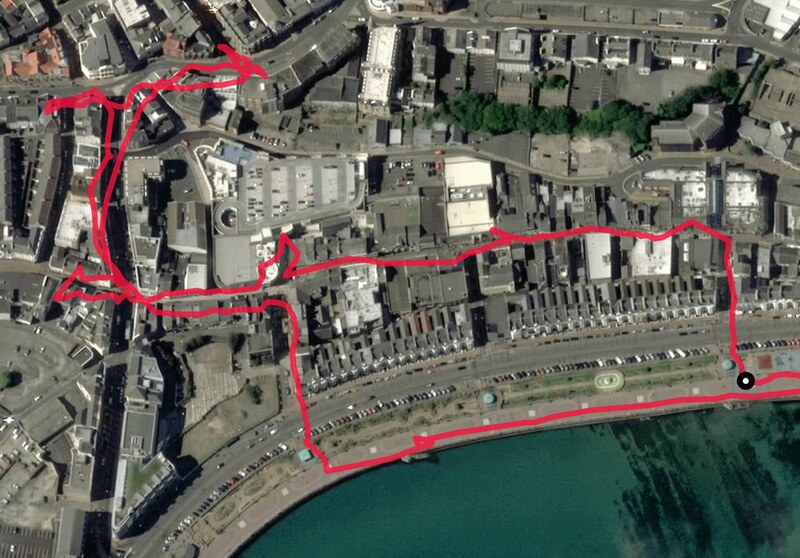 Starting with the simple stuff, here’s a walk around Douglas, our sprawling metropolis. The Fēnix 5 Plus gives you a choice of GPS modes to use on a per-activity basis; GPS only, GPS + GALILEO, and GPS + GLONASS. I’m not sure why GLONASS and GALILEO should be mutually exclusive, but there you are. Here I’m using GPS + GALILEO and the results are pretty much in line with what I’d expect from a wrist-based location device; smooth out in the open, struggling a bit between buildings. At the back of my mind there’s a niggling feeling that this could be better. 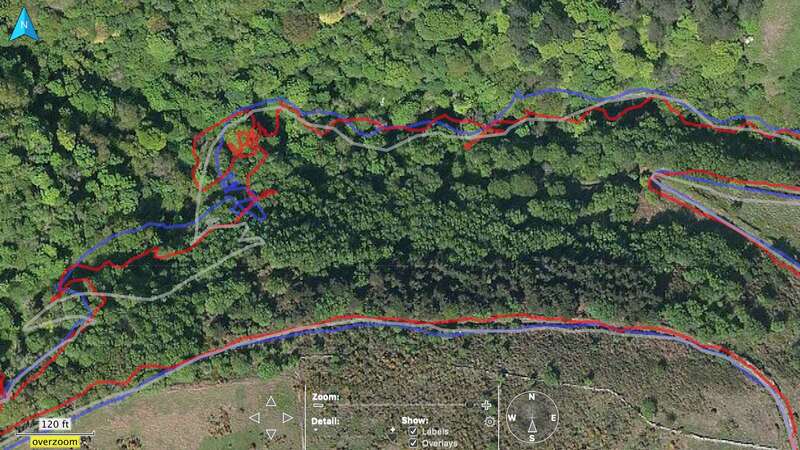 Certainly I’d expect more resolution and accuracy from a dedicated GPS unit such as my 64S, but something tells me that the old Forerunner 920XT was superior as well – which is why I took all 3 devices to Dhoon Glen. The overview below shows us that all three are on an even footing when there’s an unobstructed view of the sky, all the way down to the beach. Once on the beach I had to find a place where I could cross the river on the final part of its journey to the sea, and this provided a good opportunity for seeing how well the three GPS receivers would resolve small changes of direction with a fairly good view of the sky. Bear in mind that all 3 were using standard factory / automatic settings with regard to sampling rate, and that both the Fēnix 5 Plus and 64S are using GPS + GLONASS while the Forerunner 920XT is stuck with just GPS. Here we see that the Forerunner 920XT and 64S are within just a few feet of each other, while the Fēnix 5 Plus shows a more erratic path. Climbing into the glen now, the tree cover is getting more dense, despite it being the middle of January. I’m criss-crossing the river on several short bridges and beginning to feel the combined effects of 190 steep stairs, a full backpack and 3 GPS gadgets. Predictably the three tracks start to spread out from each other here, with both the Forerunner 920XT and the Fēnix 5 Plus keeping a similar overall distance from the 64S. Being critical, you could say that the Fēnix 5 Plus shows the most variance of all three, especially where I stopped to catch my breath after a particularly steep section. Some drift is to be expected from any GPS device under these conditions, but the Fēnix 5 Plus appears to make a particularly poor job of it. Here’s another view of the same section, highlighting the Fēnix 5 Plus (red) against the Forerunner 920XT (blue). In conclusion I’d say that the GPS capabilities of the Fēnix 5 Plus are tailing somewhat behind the cheaper Forerunner 920XT, and in all probability other lower-end fitness devices. How so? The only explanation I can come up with is that despite GLONASS and GALILEO support, the metal components of such a premium device compromise its ability to accurately deal with GPS signals. Although my Forerunner 920XT is fitted with a more basic GPS chip it’s made almost entirely of plastic, and appears to produce a much smoother track log, with less hunting when stationary. Initially I couldn’t understand what all the internet noise was about; the first few nights I wore the Fēnix 5 Plus to bed it tracked my sleeping and waking times pretty accurately, with the exception of REM sleep, which for some reason lasted longer than my ‘deep’ stages and always occurred right before getting up. I thought REM was one step deeper than ‘deep’ and therefore would occur in the middle of ‘deep’ – but I’d be lying if I said I really cared. What I did start caring about on subsequent days was that the Fēnix 5 Plus would track sedate pre- and post-bedtime activities as actual sleep, regardless of whether I was actually watching TV before turning the lights out or scanning my emails having just woken up. This was never a problem with the Forerunner 920XT because you have to start / stop sleep tracking manually, which on the Fēnix 5 Plus equates to remembering the time you go to sleep (not easy) and noting that and the time you wake up manually in Garmin Connect (cumbersome) in the morning. I appreciate that it’s difficult for the device to differentiate between sleep and adjacent low-energy activities, that’s fine, but why take away my ability to start and stop sleep tracking manually from the device itself? Maybe that would be too much like admitting defeat where automatic sleep tracking is concerned – only Garmin knows for sure. Another hot topic in the Garmin forums is the Fēnix 5 Plus longevity between charges, with many owners expressing frustration at their device’s lack of stamina or consistency thereof. I’ve experienced mixed results myself; sometimes it will use 45% of its power reserve in the course of a short run and a bike ride, other times I can record a night’s sleep followed by a 2 hour walk and the Fēnix 5 Plus still shows 100%. But I don’t really care about that. As long as it lasts though a day containing any activity I’m capable of, I’ll be happy. On average I’m seeing 3 or 4 days between charges, which is at least two more days than Apple Watch. This is fine. What Garmin Pay? Right now there are two banks in the UK which support this feature, and I’m a customer of neither. Which is just as well, because the UI for entering the code which locks your ‘wallet’ appears rather clunky. I could be wrong in this, but the Forerunner series strikes me as much more of a dedicated running watch than the Fēnix series, with the Forerunner 920XT being no exception. It’s about half the price, feels cheaper, but works better; the included HR strap is far more accurate than the Fēnix 5 Plus optical sensor, and despite ‘only’ being a GPS device the Forerunner 920XT produces a marginally cleaner track log. When I bought mine, I opted for the pink version rather than the black version because in my opinion the garish colour accentuated the ‘geekiness’ of the device, which wouldn’t be something I’d wear 100% of the time anyway. The Fēnix 5 Plus meanwhile tries to be much more of an everyday wearable and pulls it off quite well by appearing more like a real watch, and integrating smart watch elements like calendar, Garmin Pay (if your bank supports it) and notifications, which can now be dismissed from your phone via the wearable. The ability to play music straight off the Fēnix 5 Plus is also a big plus, but Garmin’s implementation leaves a lot to be desired, and I’ve struggled for hours trying to get Garmin Express to recognise my iTunes library before confirming via Support that media files need to be stored on your local drive, not on a NAS. Spotify setup (premium accounts only) is somewhat simpler but has since packed up requiring a complete re-sync, which is again frustrating since you only notice these things at the start of a run. Finally, the onboard mapping is superb, as it should be given Garmin’s pedigree. Once caveat however is that the Fēnix 5 Plus no longer appears as a mass storage device when you connect it to your computer, so if you want to access the actual file system you’ll have to download a third party app aimed at Android devices. Basecamp does see the Fēnix 5 Plus and can be used to create routes for later use, and retrieve track logs from previous activities. Of course the best bit about the built-in maps is that you can use them ad-hoc during an activity to check your route, or even plan an activity right from the device if, for example, you’re somewhere new and want to get your 5k fix. I’ve not tried this yet and can’t comment on the supposedly superior crowd-sourced navigation feature, but it does sound like a great way to use all of that user data Garmin gobbles up each day. Oh, and speaking of connectivity, the Fēnix 5 Plus supports something called TrueUp, which synchronises activity data across most recent Garmin devices via the Connect app, so you can see the metrics from that bike ride with the Edge 1030 right on your Fēnix 5 Plus, and all those data streams work together in determining training load, etc. Non supported devices like the Forerunner 920XT still contribute to the TrueUp data in the cloud, but metrics from other devices isn’t streamed back to them. In summary I’m going to say what you knew anyway, that the Fēnix 5 Plus is a good all round, fitness orientated wearable. If you’re seriously into cardio sports there are better (and cheaper) devices out there. This is a tricky one, and not because the devices are similar, which they aren’t. It’s tricky because anybody looking for a meaningful comparison between any high-end Garmin wearable and an Apple Watch clearly doesn’t know very much about either device, or what they want it for – it’s like pitching a sports car against a pickup truck without knowing if the buyer wants to enjoy the thrill of the open road haul garden machinery. But I digress. Simply put, the Apple Watch is a superb smart watch with mediocre fitness tracking, whereas the Fēnix 5 Plus is an excellent fitness device with some token smart watch ambitions. See what I mean about different use cases? Let’s start with the smart watch stuff. The Apple Watch is the clear winner here, offering an impressive subset of your phone’s functionality without getting said device out of your pocket. Not only do you get easy to manage notifications on the Apple Watch, you can deal with them too, including answering a call and speaking to the other party using the inbuilt speaker and microphone. Text messages are easily replied to using preformed templates or dictation via Siri, who is also on hand (sorry) to help with other queries, such as offering an impromptu countdown timer when cooking, setting a quick reminder to buy more bouquet garni when you get to the store, or confirming random titbits of information like Barbara Streisand’s birthday. Don’t ask. Plenty of iOS app developers offer a Watch version of their app, and every bank I’ve tried works seamlessly with Apple Pay, just set the card up by taking a picture of it with your phone. Playing some kind of media on your phone, like Spotify, BBC iPlayer, or the native Music app? Apple Watch automatically switches to Play mode, where the watch face is replaced by easy to use play / pause / skip controls, and the crown acts as a volume dial. It’s little touches like this that have put Apple firmly at the top of the smart watch pile, and it looks to remain there for foreseeable future. The Fēnix 5 Plus smartwatch offerings are predictably more slimline. You can forget Garmin Pay for a start if you live in the UK. Notifications do trickle up from your phone, and unlike those on the Forerunner 920XT can actually be dismissed via the watch, so you’re not reading them a second time when you get your phone out. Incoming calls can be dealt with in a similar manner. There’s a calendar app which shows your next appointments, but it was so slim that I removed it from the widgets in order to have ready access to more useful info without having to skip over it all the time. Er – I think that’s about it. When it comes to fitness tracking, the Fēnix 5 Plus shows us why Garmin could be considered top of the pile amongst wearables, providing the wearer with a staggering array of data for more activities than you can shake a stick at. What’s more, all that data is up there in the cloud, and can be synchronised with other (recent) Garmin devices as well as third party companies like Strava and My Fitness Pal, letting you customise how you interact with your workout metrics. Apple meanwhile push their simplistic yet visually attractive 3 rings interface representing time spent being standing, active, and, er, more active, and offer a basic choice of workouts. All that data stays on your device though, and as far as I know can’t be synced with outside providers. It’s also pretty simplistic when compared with Garmin; there’s no running dynamics, no ongoing training programmes, no custom workouts, and don’t even be thinking about stuff like VO2 max or lactate threshold. To wrap this section up, I’d say that if you’re thinking about getting a Garmin you’ve already made up your mind that you want a fitness device, and as such you will ultimately end up restricted and / or bored if you get an Apple Watch. The boredom part may come later, because the AW has a fantastic display, excellent UI, and many, many, features, but you wanted a fitness device and not a pretty distraction. Conversely, if you want the best smart watch out there and your fitness ambitions end with the occasional run then an Apple Watch will tick your every box, as long as you have an iPhone. Buy a Garmin Fēnix 5 Plus and you’ll be frustrated with the unintuitive interface and clunky connection to your Mac, both of which at times feel as though they’re still in beta and have been rushed out early to box-tick their stake in the market. Many people would consider this to be little more than window-dressing, and are going to be focussed on performance, specifically heart rate monitoring and GPS. And those people are going to be disappointed with the Fēnix 5 Plus because there are other devices out there which will kick it into the dust. Am I being picky here? Yes, the heart rate sensor works, but it shows little more than an approximation of what your ticker is up to, requiring you to pair an external sensor if you want data you can actually use. 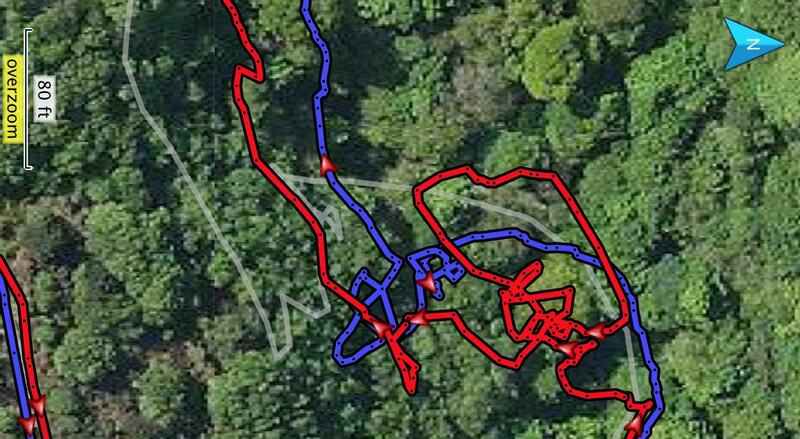 Don’t care if the GPS track looks a little wobbly on the map? You should, because while the Forerunner 920XT and 64S both recorded 1.9 miles in Dhoon Glen, the Fēnix 5 Plus measured my hike at 2.1 miles – that’s a difference of as much as 10% for a short workout of which only 50% was amongst the trees. You’re happy to trust this for your 10k personal best? From the sensors to the software, a lot of this device feels like it’s still in Beta, or hasn’t made it out of the proof-of-concept stage, yet the product marketing, list of features, and – most importantly – the price build the expectation of a well-rounded, do-it-all device. Which is a shame, because you’re in for disappointment at almost every turn. The only reason I’m keeping my Fēnix 5 Plus is that I appreciate the advanced metrics it gives me over my Forerunner 920XT; workout load, VO2 Max, lactate threshold, anaerobic training effect, etc. Being an optimist I’m not going to suggest that the only reason I can’t get those from my Forerunner 920XT is that it’s crippled via software not in Garmin’s interest to add them to older devices, to which Garmin might respond by pointing out that you need an always-on heart rate sensor to measure all that fancy stuff. Which in turn would make me question the value of those extra metrics, given what I’ve learnt above.